"Enter the Acoustic Signature Double X.......Play a recording and you will only hear the information contained in the recording as interpreted by the cartridge. I hate to tell you, but there is indeed a correlation between price and performance. Can you spend a lot less and still hear music? You already know the answer. As for me, could I settle for less musical verity? The answer is hell no! I would never stop wondering. Like the Peggy Lee song, "Is that all there is". The Double X is the vehicle to bring all the escapist enjoyment your musical heart desires. It is made with all the Teutonic precision that allows Mega Cartridges of any price to perform for you." 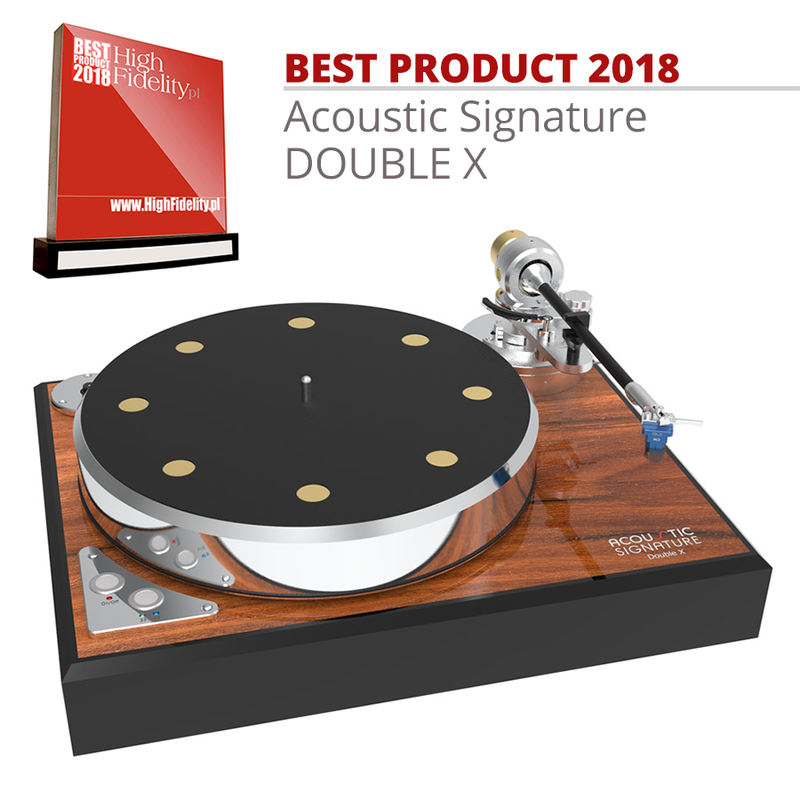 Acoustic Signature build world class turntables - real mechanical masterpieces – and they have been mastering this craft for more than 20 years now. The DOUBLE X was designed to offer a product to music lovers looking for a more classic and traditional design. The wooden veneer is covered with a 10 layer piano finish. Beside this elegant look the DOUBLE X is full of modern technologies and idea´s. It comes with a sandwich design of the plinth made from steel and Aluminum and wood. This clever arranged sandwich results in high internal damping and great sonic performance. 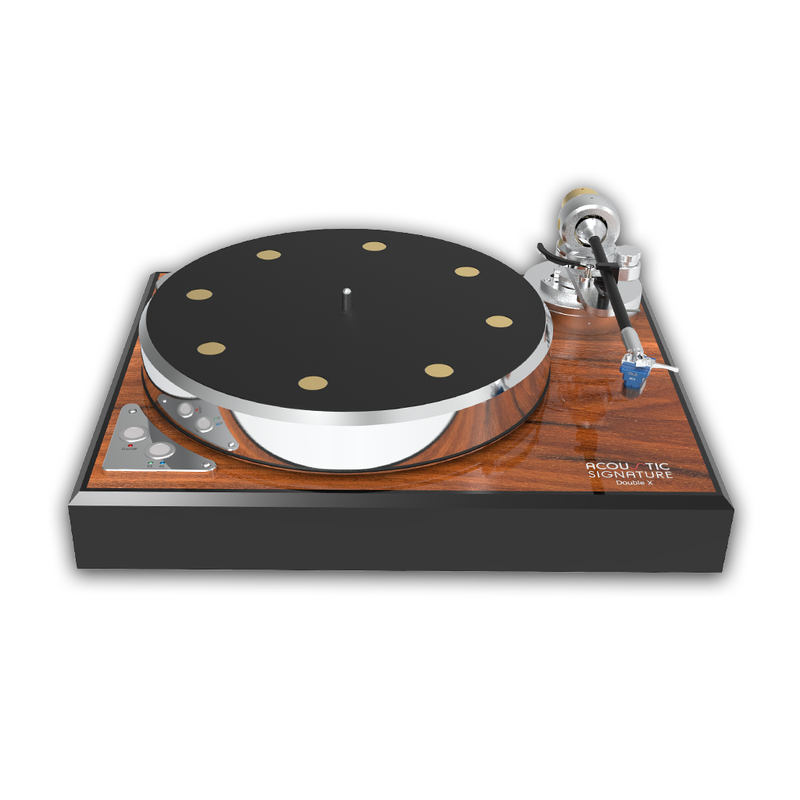 It‘s all combined with the award-winning performance, elegance, convenience and comfort that have made our mass turntable Series so successful all over the world. With the new DOUBLE X Acoustic Signature combine a massive sandwich plinth of 60mm with a 50mm massive Aluminum platter. The sandwich is made by using laser cutting and flexible glue. The DOUBLE X comes with a precisely manufactured 11kg Aluminum platter. The platter is additionally coated on the back side with a high damping material to get great results. An 8 Silencer platter is part of the DOUBLE X design. We at Acoustic Signature believe that a motor system for a turntable should have enough energy to speed up the platter but not influence him during rotation. We reach that aim by using a precision DC motor with a internal speed control. DMC1 Switching Power Supply comes as standard.